Solid Crystal Opal Sterling Silver (925) Pendant. This pendant is much more beautiful in life than it appears on the images! Beautiful solid crystal opal (Lightning Ridge opal!) set into a beautiful hand-made sterling silver pendant. The opal is a 2.10ct solid crystal opal, very bright, 4 out of 5 in brightness. It's N7 light in body tone! Looks great under any light! The pendant is hand made from sterling silver (925) (it's Rhodium plated, so it won't tarnish)! The pendant weighs 3.05 gram. 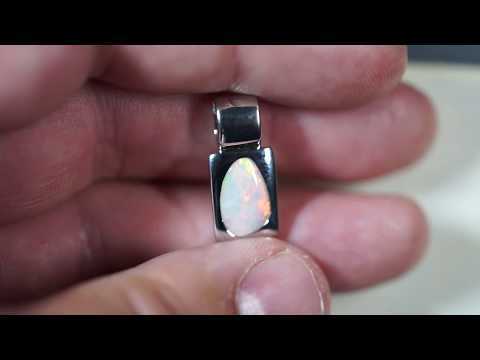 This hand-made opal pendant is absolutely gorgeous. BUY-IT-NOW !!! DON'T MISS OUT!!! * Body tone is N7. * The size of the stone is 12.5 x 8 mm. * Thickness of the stone is 3.5 mm. Slightly domed. * The weight of the stone is 2.15 ct.
* The weight of the pendant is 3.05 gram Sterling Silver (925) Rhodium Plated. * Measurements: 23 x 10 mm. Don't miss out on this truly beautiful solid crystal opal pendant! BUY WITH CONFIDENCE! I am an honest seller.